It proved to be everything a rivalry game should be. The cheers of the crowds. The thumping of the bass drums. Parents in school gear and students with faces painted. As the savory smell of popcorn wafted through the crowd - it all came together into a culmination of excitement and anticipation of what the night would hold. And the night turned out to be everything the Shorewood Thunderbirds had worked for and hoped it would be - a huge ‘W’ when the final whistle was blown and grasping the Shoreline Rotary Cup for the first time in three years. The game was closer than the final score would seem - with a tight defensive battle seesawing back and forth through the end of the first half until it began to break for Shorewood. Shorecrest entered the game at 3-0 led by junior quarterback Eladio Fountain (6’2/240) who had administered an accurate and potent passing attack through the first 3 games of the year. 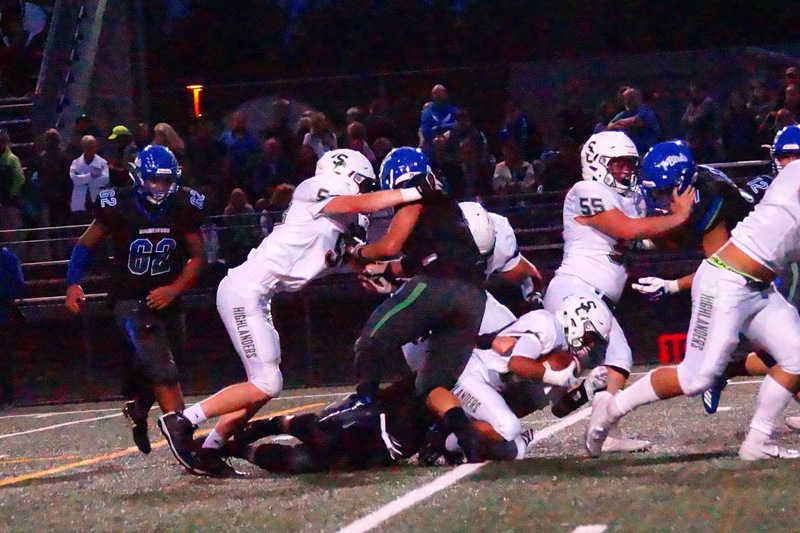 The feeling seemed to be Shorewood would be an obstacle, but would not stand in the way from the Scots starting 4-0. Shorewood and Shorecrest both showed strength in defense during the first half. Each team struggled to find an offensive rhythm and to move the ball down the field. Shorecrest had a few promising drives with the help of short runs by #22 senior running back Cyris Filoteo (5’3/147) but the Shorewood defense made him pay for each yard. Shorecrest began to put together a promising drive at the end of the first half - with Fountain finding his receivers within the Shorewood zone and a score looked imminent. Dropping back with 6 seconds left on the game clock, Fountain faced pressure from the Shorewood defensive line, stepped to his left and lofted a bomb down the field. As the ball sailed - #2 senior strong safety Jaro Rouse (6’2/185) streaked out of center field and snatched the ball from the outstretched arms of the Shorecrest receiver and he was off for a 60 yard scamper down the right sideline, easily outpacing the Shorecrest offense, who looked stunned by the speed of the Shorewood free safety. Time expired and Shorewood was up 7-0 at half and took a tremendous momentum boost into the locker room. The Shorewood defense came up big again in the 3rd quarter, at the 2:34 mark, as senior #53 Tres Zeigler, (5’10/215) who anchors the offensive line at center and moved to outside linebacker on defense, came up with a huge interception of a Fountain pass on the Shorewood 15, returning the ball to the 27. Zeigler and his teammates were ecstatic - and the defense denied Shorecrest again in the red zone. 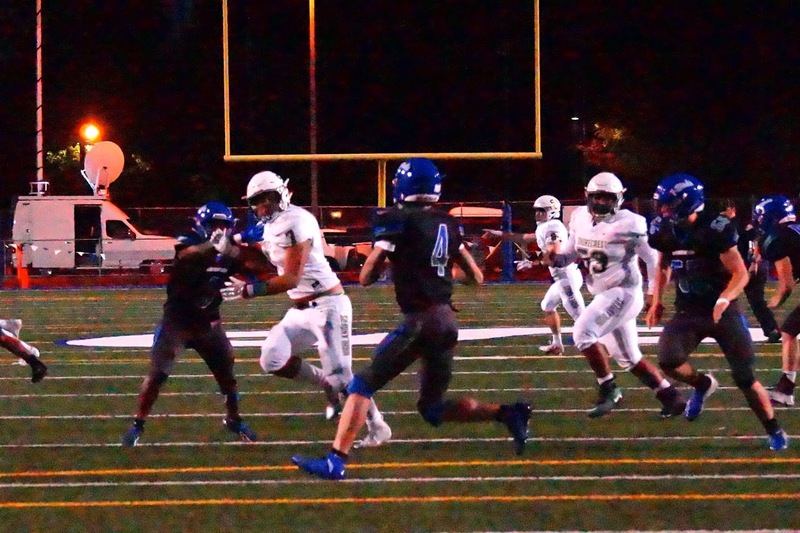 Two plays later, senior #4 David Snell (6’3/175) hit a streaking senior, #5, Joseph Williamson (5’9/165) for a 73 yard touchdown pass, and Williamson went untouched into the end zone and Shorewood went up 14-0. After holding Shorecrest on downs at the end of the 3rd quarter, Shorewood took over on their own 26 and began to move down the field. Facing a 4th and 12 - Shorewood lined up for a punt, but Coach Brandon Torrey went to his bag of tricks and senior #22 Kaden Graves (6’3/225) took the direct snap and hit junior #12 Spencer Osborn (6’1/165) in the right flat and a first down, keeping the Shorewood drive alive. Shorecrest held and Shorewood lined up for a 35 yard field goal on the Shorecrest 21. 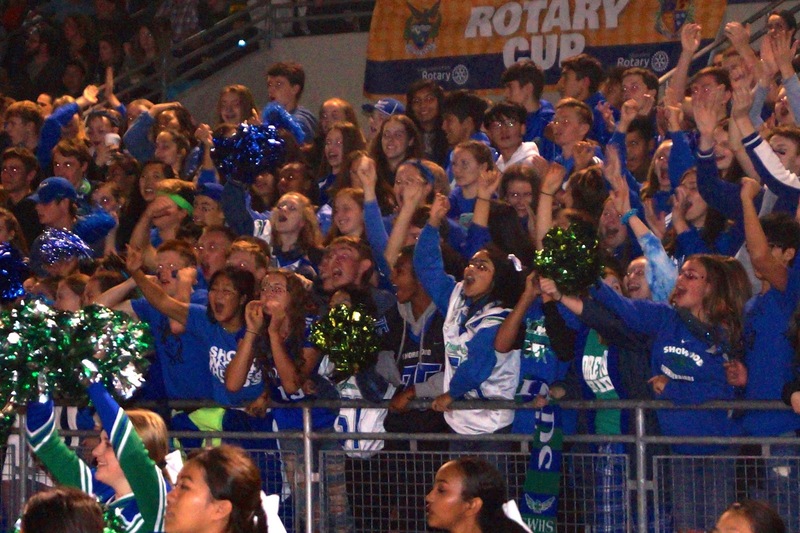 And, due to the fact Shorewood has found an absolute gem in first year kicker, junior #18 Alex Lim (5’8/140) easily booted a 35 yard field goal and Shorewood began to pound the final nails into this game, 17-0. And the Shorewood fans went wild! 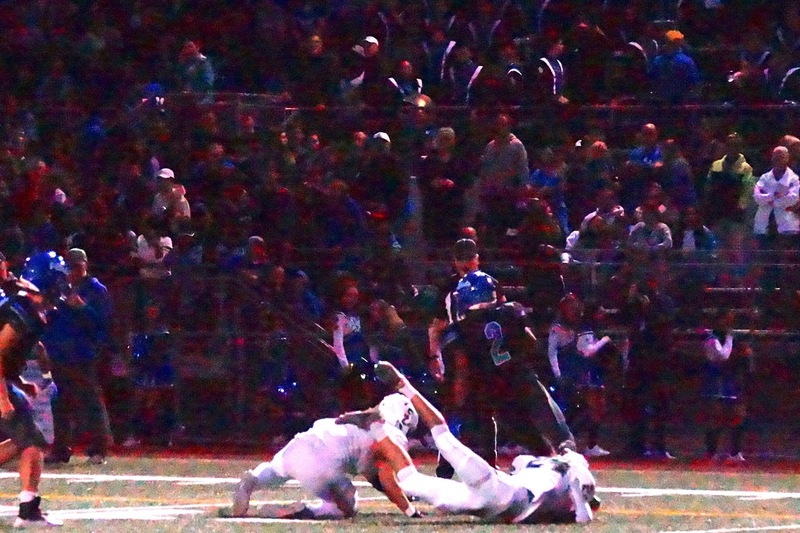 With 1:37 left to play, Shorewood sacked Fountain on 4th and 18 and took over on the Shorecrest 45. Senior #3 Robert Banks (5’8/160), who had been bottled up for most of the night, took his 15th handoff and broke over right guard for a 45 yard touchdown. A fitting end to a well fought and well played game by both teams. Shorewood’s secondary is a definite strength. Cornerback Spencer Osborn is an absolute monster on the corner, using sound technique and strength to shut down passing lanes and leveling hard hits on run support. Coupled with senior cornerback Skyler Hammer, Jaro Rouse, and junior Kody Carpenter - Shorewood might just have its own Legion of Boom. 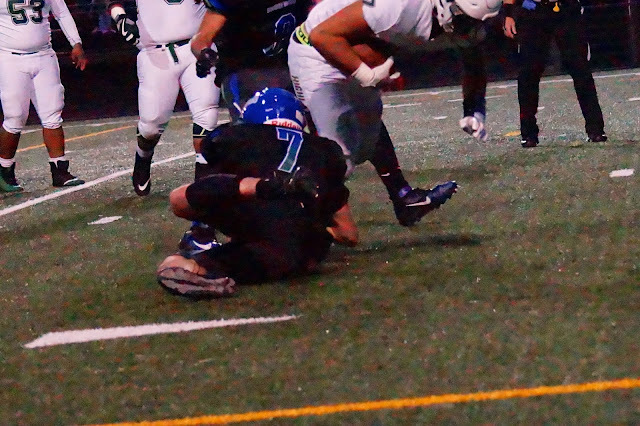 After getting shredded last week by the running attack of Snohomish, the Shorewood front 7 showed a better nose for the ball this week. On most run plays, Shorecrest runners were hit within 1 to 2 yards of the line of scrimmage and often in the backfield. Senior quarterback David Snell is coming into his own - once again, although not lighting up the passing attack this week, he demonstrated a sound maturity and did not try to force the ball when a play was not there. Shorewood played a complete game, on all three fronts. Playing all four quarters has often provided difficult in the past for the T-birds - but Coach Torrey has been preaching completeness in effort and it definitely showed this week. 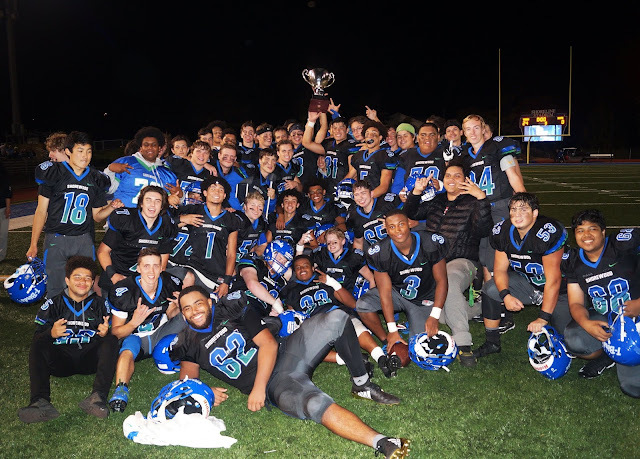 The last time Shorewood started 3-1 was in 2002 when the team finished 6-4 and made its last trip to the play-offs. 2002 was also the last time Shorewood recorded two shutouts in a season. In four games, Shorewood has now scored more points than it did in all of the 2016 season. game is featured - and it's usually the Rotary Cup. Shorewood plays next Friday night in Everett against the Everett Seagulls (1-3 Overall / 1-2 WesCo South) and Shorecrest squares off against Snohomish (2-2 Overall / 2-0 WesCo South). 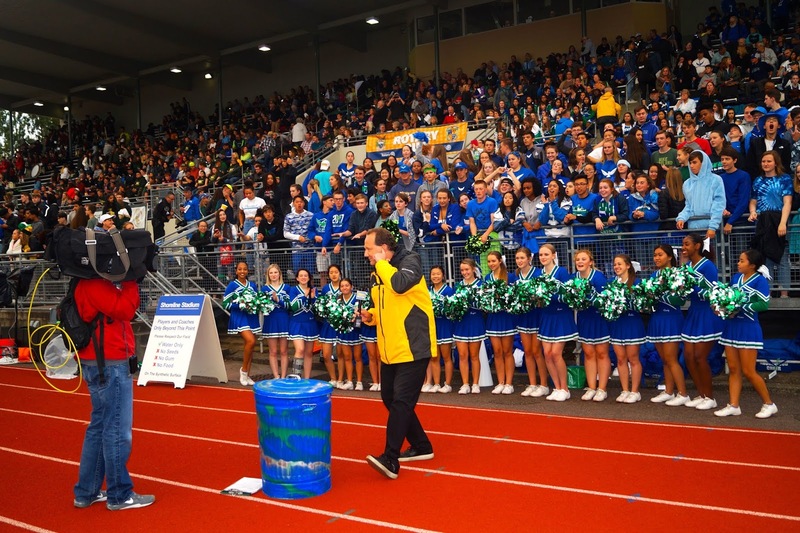 This season is shaping up to be an interesting one, as the league's eminent powers find the standings reversed with Edmonds-Woodway and Meadowdale looking up at Shorewood and Shorecrest sitting atop the standings.